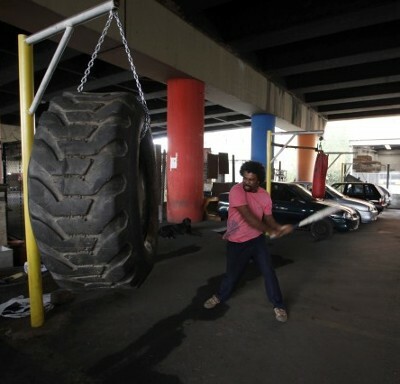 Below is a link to an incredible story about a boxing gym that exists under a viaduct in Sao Paulo, Brazil. The photographer did an amazing job. Take a few moments to look through his work. Stories like this are a welcome slap in the face to today’s fitness industry. As you will see, the fighters at this gym excel in an environment that is as low-tech as anything you’ll ever find. Clearly, access to equipment is not what determines their success. Success instead comes from the desire that these athletes possess and apply to whatever tools are available. And while this gym may appear crude and barbaric to some, fighters have thrived in minimalistic settings for longer than we’ve all been alive. Many of the greatest fighters of all time came from poverty-stricken environments. As countless athletes have demonstrated before, greatness does not come from a piece of equipment. It comes from a ravenous desire to succeed. If you are passionate about improving, you will find a way to advance with anything, or nothing. If there was ever any doubt about low-tech training, these fighters have ended the debate. awesome post great story nice read. When I first read this article (I think I saw it on the Ross Training Facebook page? ), I just remember that I have no excuses not to train. ever. I must overcome myself. Thanks for posting this Ross. These kinds of messages are always welcome. The pictures are amazing! This resets the expectations to the expensive gyms with their high tech equipment. It’s not necessary to buy a 100$/month membership if you have access to some metal, stones and basic equipment. Reminds me of this article about a gym in a ghetto of Bangkok that produces a number of really good young fighters. Definitely goes to show that what is really important is a skilled teacher and willing students. Great story and pics. Brazil produces some of the worlds best soccer players and if you see the concrete fields that these kids play on you’d wonder how they do it. I thinks it’s part heart and determination, but also they know no other way. These our their circumstances and they just rise above them. Very inspiring stuff Ross. KC , that’s the exact gym I immediately thought of too!Did you see the documentary on NHK World which featured this gym? !So inspiring!Thanks for posting that up,it’s now in my favourites..Gaz. Once again, a testament to desire, and answering the question “How Bad Do You Want It?” with action, not words. Known as “backyard” gyms in the caribbean, these work out spots are the most hygienic facilities you will find. Users always take their outside shoes off when entering the area, keep the equipment meticulously clean, and show that they have pride in their bodies and self by how they treat the gym. The honor system is in place to respect everything, including entrance fees. Whenever we travel it is always a priviledge to use one of these gyms rather than what other tourist call luxury in their 5 star hotels. As long as one got “heart”(not the sissy definition), everything will follow. Passion is a requirement for greatness. Heyo Ross, great article indeed! Just watched a video from Africa, you may find interesting! Awesome, I will add this video to the blog. Thanks for posting. Wow. That is awesome. It just shows that with a bit of ingenuity and so know how, you really can do anything you set your mind to. Another great tell you how it from you Ross and i couldnt agree more, I am a trainer and i see people that have been training at gym classes for months but when they turn up to my boot camp they cant even do a press up or other basic exercises properly, they can’t run for more than 10 minutes. What are they being taught at these so called fitness training sessions……It makes me mad as hell. Keep up the fantastic work buddy as it is great to see that there are some of us trainers out there that actually care about making people stronger, fitter, tougher and faster and not just taking peoples money and running.